It’s a good day when I can sit on my porch at dusk and watch the aerial changing of the guard. As the last of the goldfinches scallop their way toward their night’s shelter in the spruces and the swallows make their last swoops across the pond , they often cross paths with the bats reporting for their night shift duty. Most bats in the US and Canada are insectivores, and they save us billions of dollars in crop loss by gobbling up insects that would otherwise eat our cabbages, potatoes, pears, cherries, peaches, apples, wheat and corn. Bats seem particularly fond of the round rafter tails in Underhill House that give us the deep soffit that is part of our passive solar design. (see our blog post How Much Passive Solar Heating Do You Want in a Warming World? ) They also flock to the timber frame beams in our barn. This Little Brown Bat preferred the upper walls of our lean-to greenhouse. During spring, summer and fall they use roosts in trees and buildings. This is where they bear and rear their young and spend each night eating insects. They survive our cold winters in underground hibernacula. There are many caves and abandoned mines here in the Driftless Area, and Wisconsin is home to several of the upper Midwest’s largest bat hibernation sites. 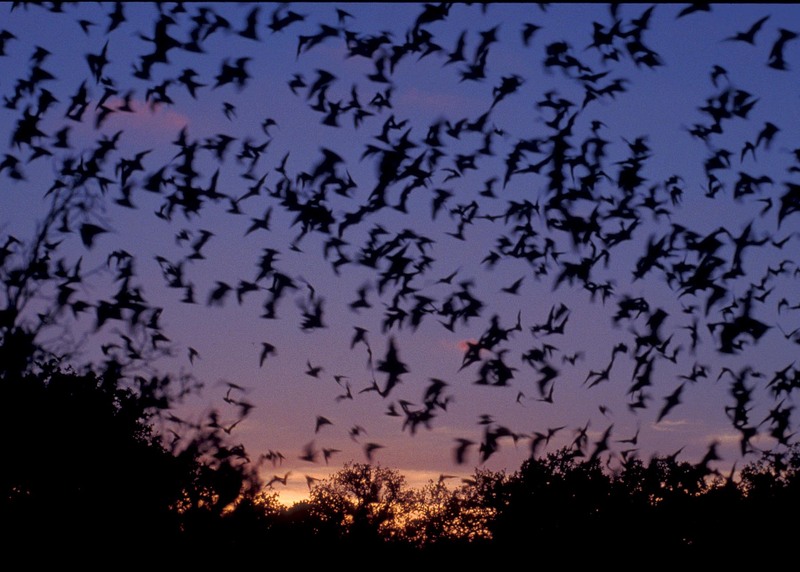 Estimates have put the population at 350,000 to 500,000 bats overwintering here. I’ve never seen bats in their underground winter digs, and I seldom spy their daytime lairs, but I know where they spend their summers at Underhill by the sprinkling of dung pellets (guano) that accumulate below. Bat guano – it’s garden gold, equivalent to a 10-3-1 commeercial fertilizer. 10 parts: Nitrogen, which encourages fast, green growth. 3 parts: Phosphorus, which boosts root and flower development. 1 part: Potassium, which is generally useful to plants. It’s a great bounty! And by regularly sweeping our barn floor, we are starting to accumulate a useful quantity for perking up our plants. Still, it’s a bit yucky to have guano dusting everything we keep in the barn and crunching under our feet along the edges of our porch. In an attempt to lure them from the barn and porch, Doug put up a bat house on the outside of the barn this spring. We’ve even dreamed up a Rube Goldberg devise to collect guano in the new location. So far, no one has moved into our cool bat condo – they’re apparently pretty happy where they are, and the instructions with the bat house advised that if the bats had not moved in within three years, to try another spot. A lot can happen in three years for our bats. There may come a year when our bats no longer snuggle into the crevices of our buildings and swoop around at dusk, clearing the air of insects. They may not even make it back from their winter hibernacula next spring. On March 28 this year, DNR experts found bats with White Nose Syndrome in a Grant County mine in southwestern Wisconsin, putting bats in the Driftless Area at great risk. Bats in Eastern US with White Nose Syndrome. Poor, little things. They won’t wake up. White Nose Syndrome is decimating bats around the world, and this frightening new bat disease that leaves almost no survivors. Only a few years ago in February 2006, cavers observed bats near Albany, New York, with something white dusting their muzzles. Those bats all died. White Nose Syndrome had reached our North American shores, and this scourge has spread since then to 23 states. There are people working hard to protect our bat population. In Wisconsin, most caves that serve as bat hibernacula have been seasonally closed to the public for several years as part of the measures the DNR has taken to give hibernating bats the best possible chance. Several have been closed to all access to delay introduction of the disease to Wisconsin and to slow its spread. Voluntary prevention plan agreements are in place with private and public owners of caves and mines open to human access, including all commercial caves and mines. Most recreational cavers are also following decontamination procedures that prevent transmission of disease between sites. Wisconsin citizens can help bats by continuing to avoid disturbing bats, especially during hibernation; by following all decontamination requirements for those who enter caves or mines, and by continuing to volunteer to monitor bat populations in Wisconsin through a variety of different opportunities. Wisconsin’s four bat cave species are listed as threatened, a status which makes it illegal to kill them or take action that would result in their death. 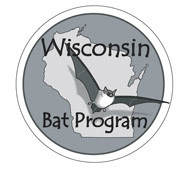 Learn more about bats and volunteering opportunities on the DNR’s Bat Program website. People who see sick or dead bats are encouraged to report them to the DNR. The DNR’s Bat Program website has a link to the reporting form and instructions for how to safely collect carcasses of dead bats. People should not touch or handle bats without appropriate protective clothing. All my life, watching the bats swooping through the sky has filled me with joy. Their nocturnal life, amazing flying skills and echolocation make them seem almost supernatural. What remarkable creatures to share the world with. But these days, my joy is clouded by apprehension. There is a small hope. Bats are tough little animals. Some people are afraid of bats. Some are afraid for them. If you are dealing with bat guano I would highly recommend wearing a dust mask. The spores raised when sweeping can be dangerous to your health when breathed into your lungs. Not all guano will have this disease but why take the change? If you want the bats to move you have to prevent access. You can block access during the winter when the hibernate or in the evening after they fly out looking for a meal. If you did it in the evening they would more than likely take up residence in your bat house since that’s the closest place they can seek refuge. Thanks for the heads-up on guano, Dan. We are pretty careful with the guano, although we haven’t used dust masks yet. It occurs in pretty small amounts that are usually still a bit moist when we “harvest” it. I sure don’t touch it with my hands, that’s for sure. But the disease issue is the main reason I would like to get the bats living on the outside of the barn. We are also planning to do what we can to prevent access after they go to their winter quarters, but I’m not totally optimistic that we can keep them out of a somewhat rustic timber frame structure. We’ve also been considering building some bat housing on poles next to our pond – but that would be a big project, and I’m waiting to see how they fare these next couple of winters. There are many hazards and wonders in the world, aren’t there?